Your rose will continue to grow and flower if you decide to leave it in the pot provided, however it will need re-potting in winter. Place in a sunny spot with good drainage and keep well watered. Please keep in mind that roses have very large root systems and will become root bound when they out grow the size of the pot. Re-potting your rose into a larger pot will be necessary after a period. Water: pots provide little insulation against the heat, this causes the potting mix to dry out faster than the soil in the ground. For this reason, roses in pots require frequent doses of water. Watering roses every day or every second day is sufficient, depending on the weather. Try to avoid letting the potting mix dry out completely. Click here for more information on watering roses. Pot Size: this will depend on the variety - miniatures can cope with a smaller pot to standards, shrubs or hybrid teas. However, the larger the pot the better. Soil: always use potting mix in pots. Never use soil from your garden when planting roses in pots. Garden soil is too dense and can compress the roots making it hard for them to grow. Rose planting is best done during winter but can be done year round, providing you don’t disturb the root system. 1. Dig a hole large enough to place the pot within. This must be in a sunny spot with good drainage. 2. Carefully slide the pot away from the plant, without disturbing the soil around the roots. ie. Do not shake the soil off or tease the soil from around the roots in any way! 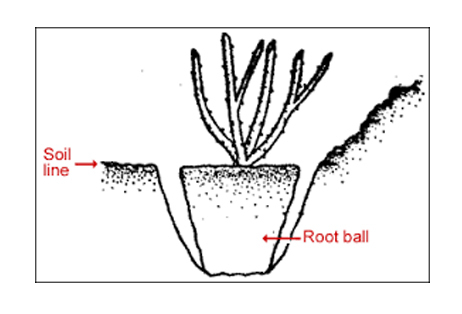 Disrupting the roots will allow air into the root system which can cause damage. 3. Carefully place in the pre-dug hole. Make sure the soil line is vertical with the top of the potted soil, as pictured below. 4. Fill in the rest of the hole with soil. 5. Keep well watered. This step is very important as the rose will require extra water while the root system becomes established in the new position. Please note: if wilting occurs, increase the water dosage. Newly planted roses require 10 to 20 litres of water twice a week.